When the QC20’s are turned on the noise cancelling is truly amazing. Having tried them out on the train, walking the roads in London and also at home they really do cut down the noise to virtually nil. It’s a little uncanny when you have them turned on with no music playing, there’s a little white noise created by the cancelling circuitry but nothing else. Once you start playing audio you appreciate just how good these headphones are and that buying a premium brand such as Bose really is worth it. One nice feature of the QC20 is the ‘Aware Mode’. This almost works in reverse to the normal noise cancelling and allows sounds from outside to be heard over the music that you may be listening to. This makes it possible for the user to hear what is going on around them while still listening to their audio. At the same time, Aware mode enhances the listening experience by maintaining a minimal amount of noise reduction to block certain background noises while still allowing the user to be aware of most ambient sounds. 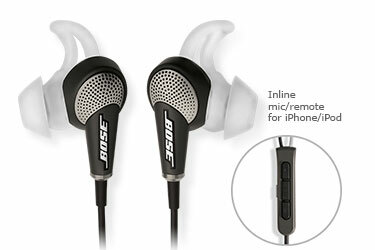 If you are a daily commuter or a frequent flyer then these Bose QuietComfort QC15 Acoustic Noise Cancelling headphones are definitely worth consideration.